The Fredericia was renamed Caroline, and the ship was registered in Panama. By now Allan Crawford had managed to acquire his own ship, which was to be fitted out at the same yard as the Fredericia. However as the yard was owned by the O'Rahilly's their ship was given preference. While in Greenore, a test broadcast was made using a Ray Charles album, but because the transmitter was not fully set up, severe interference blotted out TV sound over much of the Irish Republic. The MV Caroline set sail under the command of Captain Baeker, on 26 March. Her official destination was given as Spain. A Royal Navy destroyer inspected the MV Caroline as she passed Plymouth. The initial intention was to extend Queen magazines targeted readers as the targeted listeners. 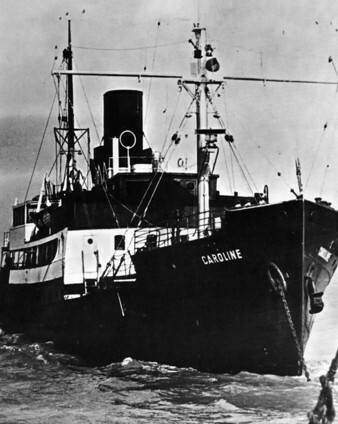 When Radio Caroline first went on the air, it operated from the editorial offices of Queen..
On Good Friday 27th March, the MV Caroline dropped anchor off the coast of Felixstowe, Suffolk at six in the evening. At nine that night, the transmitter was turned on for a short test. The first test broadcast was heard at 23:55, on 1495 Khz, with the first record being Around Midnight by Jimmy McGriff, which became Radio Caroline's first theme tune. This was followed by the Beatles 'Can't buy me love'. The test broadcast was pre-recorded, and voiced by John Junkin, who later became well known as an actor and TV scriptwriter. Easter Saturday 28th March saw regular broadcasts start at midday. Simon Dee followed the now famous 'Caroline bell' by introducing the station "Hello everybody. 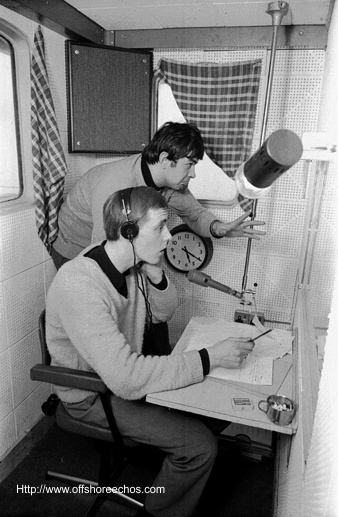 This is Radio Caroline broadcasting on 199, your all day music station" Simon then introduced Christopher Moore's programme. 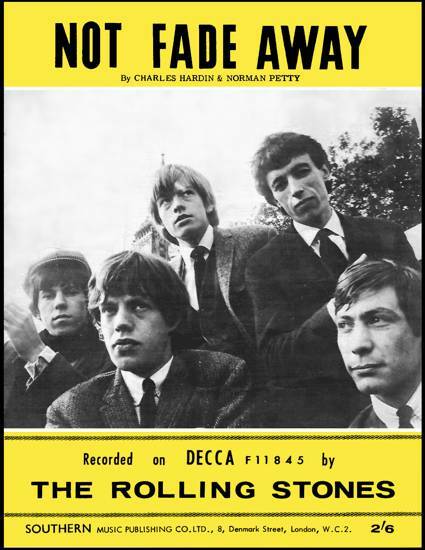 The first record played was Not Fade away by The Rolling Stones. Within two days, there were claims that interference was being caused to Trinity House broadcasts to lightships and lifeboats. Radio Caroline began broadcasting twelve hours a day, 06:00 - 18:00 on 1520 kHz with a power of 20 kilowatts. 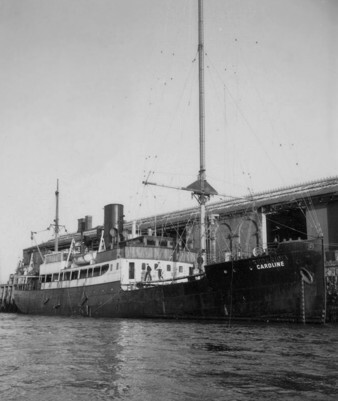 On 1st April, the General Post Office officially requested the help of the International Telecommunications Union to help stop both Radio Caroline and Radio Atlanta broadcasting. Three days later, the ITU stated that it had reminded Panama, that broadcasting from a ship outside of territorial waters was prohibited. 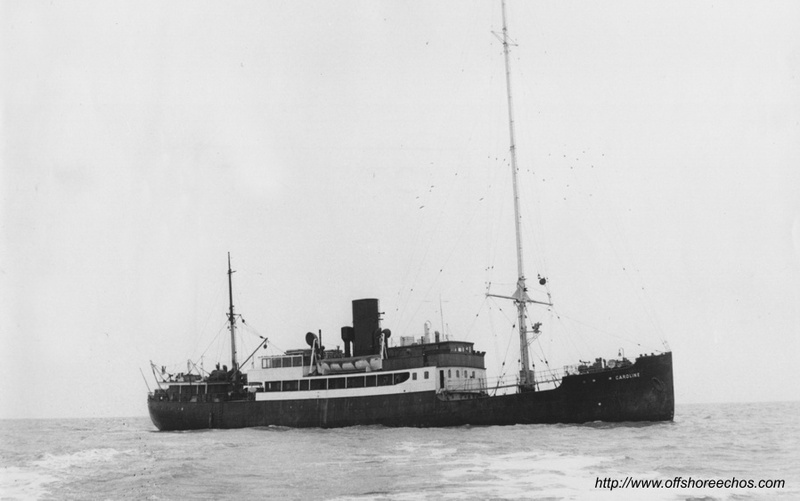 Panama withdrew the ships registration on 7th April 1964.The Post Office withdrew the radio telephone service to the ship, in mid- April and would then only handle emergency messages..
Simon Moore & Chris Dee: "You're tuned to Radio Caroline on 199, your all day music station"